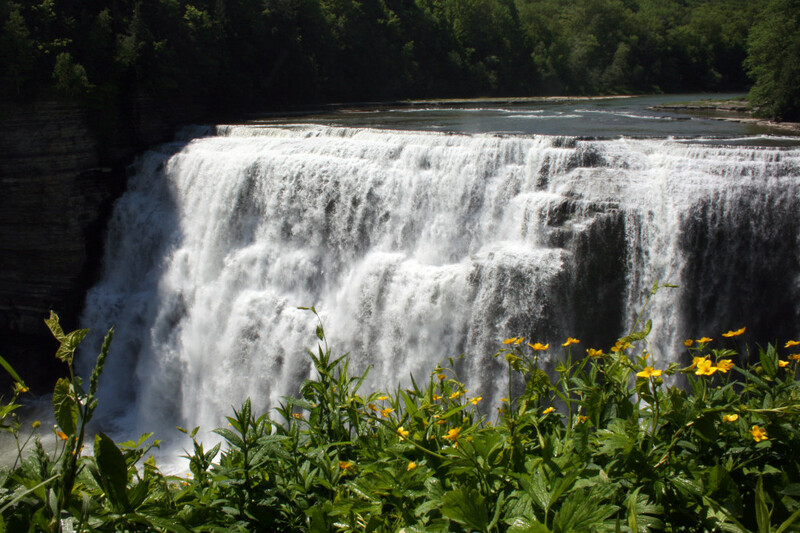 Buffalo is best known for great shopping deals and its proximity to Niagara Falls. A few people would appreciate that Buffalo was the birthplace of North America’s Arts & Craft Movement in the late 19th century, and home to some of Frank Lloyd Wright’s Prairie style and open concept architectural works. 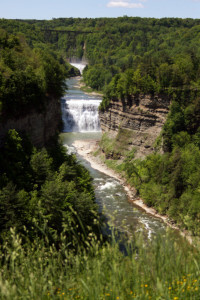 Even fewer people are aware of the natural hidden gem that is a 1.5-hour drive away: Letchworth State Park. I don’t know where I have been all these years, but it occurred to me that the USA has some of the most incredible parks in the world, just like in Canada, and I should go visit them. All of my past trips to the States have been city getaways and of course, shopping and cheesecake-related. My first State Park hike this past summer changed that for the better. 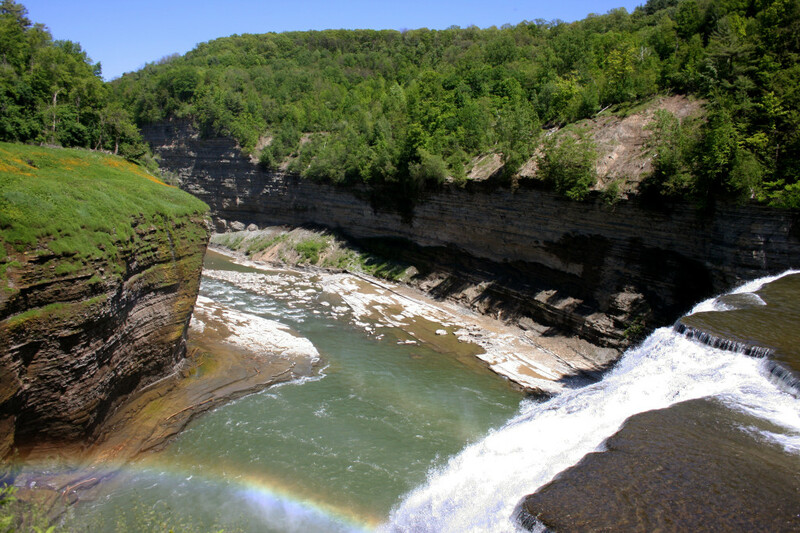 Letchworth State Park is roughly 100 km southeast of Buffalo. I recommend grabbing a bite to eat in Buffalo, as there was mostly farmland in between, and the few restaurants that we did pass by were closed on Sundays. The park has several entrances and we headed towards the Portageville Entrance in the south, because the three waterfalls were located in the south end. 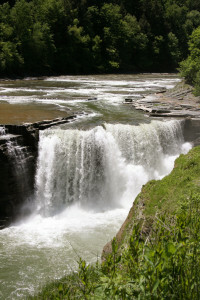 The entrance was off of Route 19A S/436 E, on the west side of the Genesee River that ran through the park. After we passed through the park gate, we followed the signs for the Gorge Trail and parked at the first lot on the left-side. We were immediately greeted with the Portage Railroad Bridge towering above us and Upper Falls gushing below. 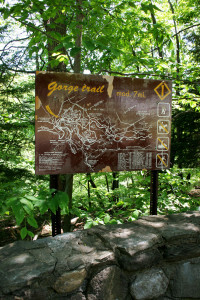 The Gorge Trail runs along the main road for cars, so the plus-side is that the park is very accessible to families because you can drive and park at each viewpoint. The minus-side is that the trail is not as secluded as we would’ve liked, but the spectacular views make up for it. Continuing on foot, we passed by a large, open grassy area, perfect for picnicking. The Middle Falls was a short walk away and was even more amazing, because the trail took us up close and along the falls. The trail continued slightly uphill and we were high above the cliff. 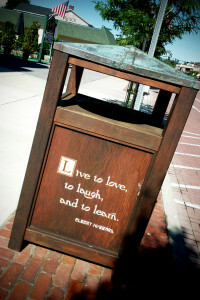 The name says it all: Inspiration Point. 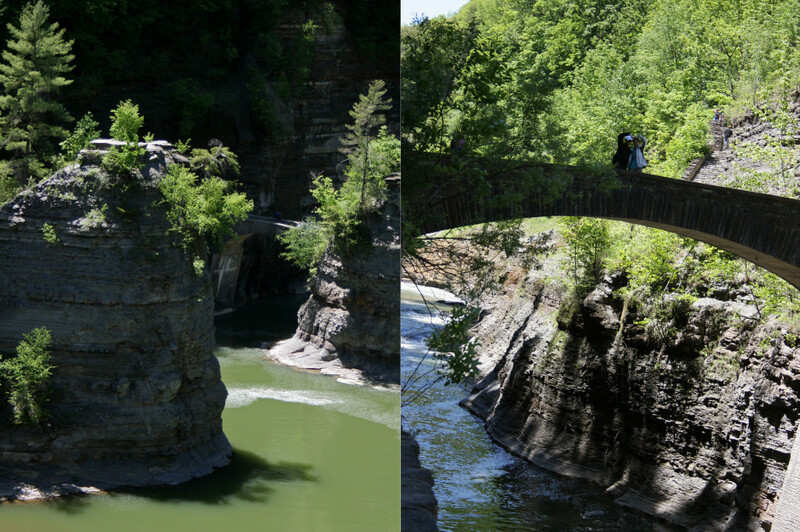 The view of the Genesee River cutting through the gorge was absolutely breathtaking. We really appreciated the scale of the park and its preservation. The trail took us through the forest and we noticed a gradual descent, which meant we were getting closer to the Lower Falls, but not close enough. At the rest area with washrooms and a gift shop, there was a sign that said we had to go down a stairway of 127 steps. No problem! 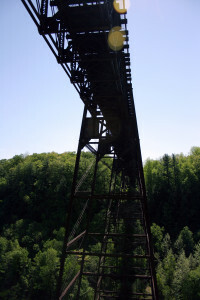 Once we reached the bottom, we found the trail leading to the Footbridge, which was the only bridge in the park that crossed the Genesee River and connected to the eastern trails. Exploring the magnificent stone bridge was worth the detour. Now onwards to the Lower Falls! It was smaller but equally as impressive. Just listening to the sound of the water falling and the negative-ions emitting (I can’t really hear that) felt wondrous. 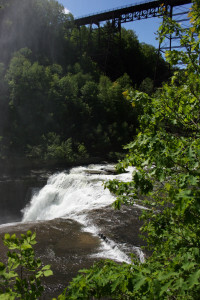 The Lower Falls was tucked in, surrounded by the gorge and forest, and felt very intimate. Looking at our watches, we decided to retrace our steps back to the starting point because it was getting late in the day. Hiking the Gorge Trail was more of a leisurely walk than an intense hike. However, we were fooled when we had to climb back up the stairway of 127 steps, and again, up the stone steps from the Upper Falls to the parking lot. But we still had enough energy to make a stop at Fashion Outlets before returning to Canada.